The Bocas Lit Fest is a year-round writing and literary arts development organisation. They run the annual NGC Bocas Lit Fest, Trinidad and Tobago’s annual literary festival (named as one of the world’s best literary festivals). Margaret Busby will be attending this year, taking part in four events over the course of the festival. The Art of The Blurb – 1st May 2019 , 1 pm – 4 pm in the AV room. A series of free seminars for budding and self-published authors on crucial aspects of the book business, with celebrated UK editor and publisher Margaret Busby amongst others. Click here to read more. New Voices – 1st May 2019, 4.30 pm – 6 pm in the AV room. A showcase of debut books by first-time and self-published authors. Click here to read more. Remembering Andrea Levy – 4th May 2019, 10 am – 11 am in the Old Fire Station, The British author Andrea Levy, who died in early 2019, won acclaim for her novel Small Island, documenting the lives of Windrush immigrants in Britain. Editor Margaret Busby, journalist Gary Younge, and NGC Bocas Lit Fest founder Marina Salandy-Brown discuss Levy’s indelible legacy. Click here to read more. 2019 Bocas Henry Swanzy Award – 5th May 2019, 2 pm – 3 pm in the AV room. 2019 awardee Ian Randle discusses his career in publishing with Margaret Busby. Click here to read more. 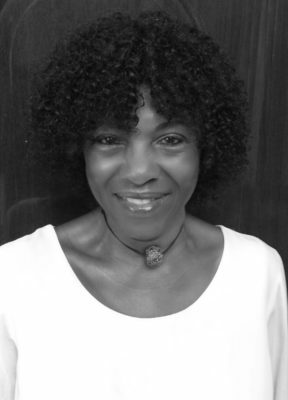 Margaret is editor of New Daughters of Africa, which showcases the work of more than 200 women writers of African descent, celebrating their contributions to literature and international culture. Bold and insightful, brilliant in its intimacy and universality, this essential volume honours the talents of African daughters and the inspiring legacy that connects them—and all of us.